Submitted by Larry Hicks on Jul 23 2018 - 8:01am. 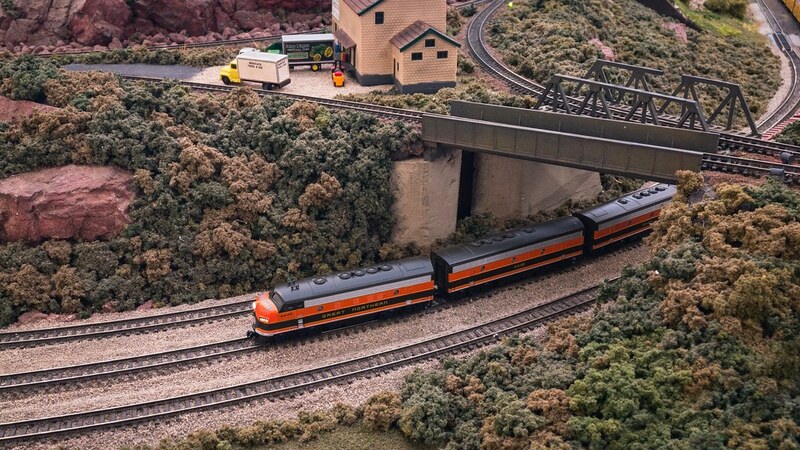 NRMRC participated in an NTRAK train show at Windsor Point Retirement Home in Fuquay-Varina, as we do each year, this past weekend, July 21-22, 2018. A total of 15 NRMRC members participated in this show, with 8 participating all 3 days. We were well hosted by the new Activity Director at Windsor Point, with supper provided Friday night and lunch on Sunday, as well as free drinks and snacks in the store on Saturday. Attendance by residents and guest was about as expected, but well less that or normal Father’s Day weekend shows. Except for Raleigh Yard and some polarity issues the layout was ready for operation at 9am on Saturday. The layout never did become fully operational — see module issues below. Tear down began at 4:00pm on Sunday with everything loaded and ready for departure at 5:40pm. Mike Floyd apprenticed as Assistant DCC master. He did most of the LocoNet cabling. The layout powered up on Saturday morning with no LocoNet issues and the loop showing no shorts. Good job. Next we will move Mike along to the control side of DCC. The weekend was overshadowed by module issues, especially Raleigh Yard. Major problems were encountered the last time Raleigh Yard was in a club layout, which was NRV last November. The same issue, loss of programming in the DS64 Accessory Decoders, bit us again. The result was that only the left half of the yard (looking from the front of the T Module) was operational. The Crossover turnouts did not operate and neither did the turnouts aligning tracks to the right side of the wye. The right side storage tracks could be used after a train ran around the return loop and accessed the throat. On the good side a lot of trains, some long, backed in and out of the yard with only a few derailments. Need to install LocoNet jacks on the Crossover and Yard 1 modules. Leg braces should be put back with their modules when packing up from a show rather than putting in a bunch. The DS64s could not be re-programmed at the show due to lack of information about the values to be programmed. Such information must be kept with the layout computer at all train shows where Raleigh Yard is used. This work should be completed prior to NRV in November, not the morning of NRV. Any remaining Cinch-Jones connectors must be converted to Powerpoles. Connectors between the yard sections should be examined to ensure they are still fully functional. The reversing loop did not auto-reverse. damage to right side of the module frame. Was module dropped? REA sign not lit. Checke and DC power provided to circuit board. Loose fence re-installed. Despite the issues with Raleigh Yard, lots of trains were run successfully throughout the weekend.